A faith that reflected societal values (such as consumerism, violence, racism, and such). A faith that guided people’s practice one morning a week, but little beyond. A faith that seemed to promote justice when there should be mercy, and mercy when there should be justice. But others did not seek to make a radical change of faith, but sought to be more extreme in certain aspects of it. This led to various Christian communes, authoritarian groups, the Discipleship movement, prophetic Christian cults, and so forth. A good example of one such group was Maranatha Christian Ministries. Ronald Enroth in his book “Churches that Abuse“ (click on the title to see a PDF version of this book) quotes at length one former member of MCM. I will rewrite the quote here. The bold portions were done by me, not the interviewee. The most significant problems with Maranatha stem directly from its interwoven concepts of discipleship and submission to authority, which, I feel, have resulted in serious, destructive abuse. In Maranatha the centrality of authority is a natural consequence of a military sef-perception. Greater emphasis is placed upon building the “Army of God” than nurturing and developing the “Family of God.” The leadership sees itself as setting up a new order on earth in the prospect of bringing in the kingdom of God, thereby establishing an external purified order in this age. Preparation of leaders is obtained as quickly as is physically possible under the guise of ministry or spiritual expertise culminating in a sink-or-swim survival of the fittest environment. The often painful results in Maranatha include a lack of leaders with a mature understanding of the Bible. Because of this, unwarranted authority is attached to the contemporary spoken word, the rhema, going so far as to hold that it is equal to the written Word, the logos. All too often the public revelation in the Bible is subordinated by the private revelations of the leadership of Maranatha, pointing not beyond themselves to Christ crucified and risen, but to the leadership’s own experience. Unfortunately, this can lead to setting goals to possess the life of God in exclusively ecstatic experience. On the emotional or mental level, the Maranatha environment encourages spirituality and experientially oriented persons to allow phenomena to determine their faith instead of interpreting experience with reason in light of Scripture. The “swallow-follow” concept, the “mind idolatry” teaching and the overall dictatorial exercise of authority all combine to form a totalitarian attitude that behavior is determined solely by unfettered or thoughtless obedience and submission to authority. … Motivation becomes fear-oriented, not love-oriented. Faith is transformed from an adventure into a duty as concern for righteousness through holiness and blind adherence to proscribed behavioral codes begin to envelop the individual’s identity. Holy living becomes a pretext for a new legalism; keeping “the law” tends to become an end in itself rather than a means of service to God. The Wrong Interpreter. We experience things, but then reason, and God’s word, help us to connect these experiences to truth. God has given each of us minds and reason… they are (general) revelations of God, to gain insight from the Word of God, special revelation.. But if these experiences are NOT supposed to be interpreted by reason, but by the interpretation of leaders… one has removed two important God-given sources of protection. God has given us His word to give us a central guide. God has also given us a mind that is in a better position to perceive and interpret our own experiences than any outside person. The Wrong Motivator. Fear replaces Love, and seeking Holiness is placed above Worship. The great commandment is built around love, not fear… and the concept of Grace is to remove fear, rather than to create new fears. Likewise, striving for holiness, making oneself “worthy” of God’s approval, is a trap, drawing us away from worshiping the holy one who accepts us although we are unholy. Do we need to change? Yes, I suppose we do. Do we need to be radical? If radical means to challenge cultural norms by living out a life based on God’s love and unity through his Son, then YES we need radical change. But radical change is not good of itself, and is usually bad. Frankly, radical change is usually pretty bad because it is often too willing to throw out unpolished jewels of truth, for new shiny bits of plastic and glass. Do we need extreme change? If extreme change means finding balance between love and justice, between loving God, loving man, and loving self…. if it means finding balance between being an agent of change and an agent of preservation, and balancing being embedded in culture and challenging culture… then YES we need extreme change. But balance does not sound very extreme, does it? In the end, I believe we need a distinctly non-extreme, unradical faith. What does that look like? I would suggest reading my post on the Epistle to Diognetus. Click HERE. I believe that is exactly the type of non-extreme, unradical faith we need. You get the idea. The motive is to get people away from Christianity as it is usually experienced and practiced. The problem is that both terms are as likely to be wrong as right. It is like in politics where people say: “WE NEED CHANGE! !” or “WE PROMOTE PROGRESS! !” It is certainly true that we need change, but we probably need a lot of things to remain the same… and even for things that need to change, some changes clearly do not improve. The term progress is hardly more satisfying… it simply means change that we think is better than they way things were before. Thus, all change that is instigated by a group is, by definition, progress– at least for members of that group. Now, lets take the image above. Consider two circles. One is “Where We Are” or “WWA.” The other is “Where We Need to Be” or “WWNTB.” Extreme means to push the boundaries or do what we have always done… but with more intensity. In other words, Extreme is a First Order Change… change that does not involve a new strategy, but a new intensity: trying to do the same things as before, but better. The arrow pointing to the edge of WWA would be extreme. Radical on the other hands is to change strategy, or try something new. That is a Second Order Change. 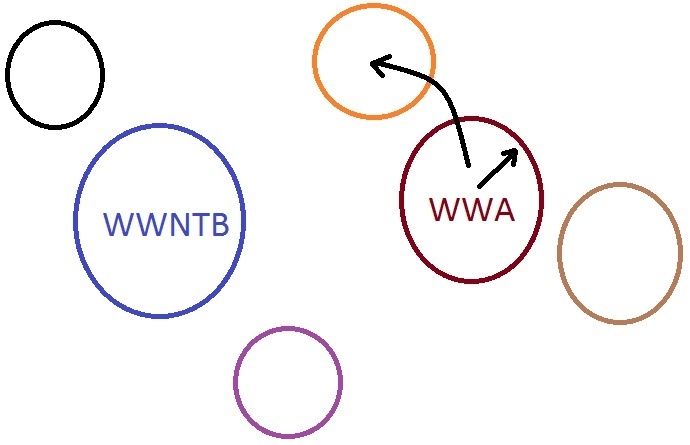 The arrow that goes from the WWA circle to the orange circle could be described as a radical change. The problem is that Extreme change and Radical change provides no guarantee that the situation is improved… only that it has changed. Let’s Take the Example of the 1800s. in the United States. At this time there was a lot of “spiritual” dissatisfaction. This led to many seeking change. Some sought to go in the direction of Extreme versions of the Christian Faith, while others to radical changes. The revivalism that swept the US in the 1800s was certainly a form of extreme change, along with the “Holy Roller” movements. Other examples include the various communes that formed such as the Harmonians, Shiloh, and more, and various apocalyptic groups. With these, the goal was to be the same, but more extreme. This extremeness may involve being the same but more emotional— or being the same but more “holy.” or perhaps “submissive.” Radical movements also were common. These were movements that replaced old answers with new theories. These include Mormonism, the Jehovah’s Witnesses, as well as Spiritualism, Theosophy, and so forth. The 1800s should have served as a warning that seeking to be “Extreme” or “Radical” in one’s faith is not, in itself, a solution. The 1970s and early 80s repeated the same cycle with various groups that sought Extreme or Radical answers with the belief that being different from “Where We Are” means “Better Than We Were.” But worse is always a possibility. We will look at some of that Worst in the next post. I did a short article on Bukal Life Care blogsite regarding the controversy among some on whether one should use the term “pastoral care” or “spiritual care.” I do have strong reasons for preferring pastoral over spiritual, and list some here. I did not go into theological reasons, but I suppose what I have is enough. Feel free to look at it. But if you prefer “Spiritual Care” or “Religious Care” or something similar, that is perfectly fine. Use without guilt or shame. How do you breathe? I recall someone talking about yoga and Indian meditation, and describing it in terms of learning how to breathe. Of course, most of us would say that we know how to breathe. It comes naturally. However, when I was in symphonic band, I was taught how to breathe properly for playing the saxophone. When I was in choir and taking voice lessons, again I was taught how to breathe. In swimming and in scuba diving, I was taught yet again how to breathe. Some could argue that LISTENING comes naturally. I am not so sure. HEARING comes naturally… but listening involves investing in, and seeking to comprehend, others. People like to argue about what the “Fall of Man” entails. To me, it ultimately is a breakdown in relationship… a general loss of desire to invest ourselves in others, as well as the disinterest to truly understand someone outside of ourselves. Of course, an internal brokenness in ourselves that makes us fail to understand who we are in terms of our relationship with God, Others, and Nature is also true. Ultimately, this all shows itself in a failure to truly listen. There are a number of problems with this, including maintaining a state of constant mini-crisis…. maintaining a fear that “What is going on” is not enough. We must be constantly vigilant to find out “What ELSE is going on.” The biggest problem though is that listening suffers. To give someone partial attention means that we are not really listening. We are skimming. Listening is a lost art. Pastoral Counseling today is often seen most in terms of listening, not advising or guiding. In fact, in an era where people do not fully listen, those who truly grasp the art of listening are sought out (and many counseling professionals get paid a considerable hourly amount… to listen). For some, the professional counselor and office have taken the place of the confessor and confessional. Dietrich Bonhoeffer notes that Christians are often among the biggest offenders when it comes to not listening. This is not simply about pastoral care or Christian fellowship. In missions, one must listen because effective missions is built off of an understanding of the other— their beliefs, their hopes, and fears, and so forth. It is also built on a mutual trust. This is a challenge. People don’t become missionaries or pastors because they like to listen. Commonly it is because they like to talk, and enjoy being listened to. It takes a certain amount of empathy (a rare quality indeed) to recognize one’s own yearning to be listened to is a trait of nearly all others as well. Christians are often encouraged not to listen to others. A poll of Americans showed that the religious group least aware of the beliefs of other religious groups is Evangelical Christians. Evangelical Christians don’t listen to others. But if one doesn’t listen to others, it is hardly surprising if others lose interest in listening as well. Several times in sermons I have heard the story of how the US Treasury, or Canadian Treasury, or various banks (or whoever) trains its people to recognize “real money” by only interacting with real money. They are never given counterfeits to inspect. The idea is that if one knows what is true, one can spot a fake. The story is completely false, and frankly does not make sense. But I believe their is a subtle message built into the story that Christians should not listen to others. They should bury themselves cognitively with people they agree with. But Christians need to leave the monastery and walk the roads talking to people. To reach them we must understand them. To understand them, we must listen. “At the very heart of all forms of counseling” (and other forms of ministry as well) “lies the ability to listen. Listening has been described as being silent with another person in an active way, silently receiving what another human person has to say. Listening, unlike other forms of silence though, requires that the listener be open and active, not asleep or dead. The true listener is quiet and yet sensitive, open, receptive and alive to the one listened to. Periodically clarify and reflect back to demonstrate and ensure understanding, as well as demonstrate interest and encourage more. This is to understand and relate, not challenge or attack. Be emotionally strong and secure. To truly listen is to expose oneself emotionally, and be exposed to deeply personal and significant facets of another’s life. I was talking with my son around 1:30 in the morning (we do tend to be night owls at times). We were talking about ministry. He mentioned that when we first came to the Philippines he wasn’t sure whether we were really helping here or not (a very fair and understandable assessment) but that he now sees his mom and I as having an important positive role here. “When we first got here, we were students… trainees. We weren’t really doing anything that others did not do or could not do. We did, however, at least act as catalysts. We helped form a couple of mission teams. One was DPDM (a medical mission group). We helped inspire people to get this in motion, but others had talked about it before we got here, and people in the group were doing medical missions before we arrived. We also cofounded a pastoral care group, but a couple of groups had been set up before we set one up. The others may have faded away, but we did not do anything that new or amazing. My son thought that was a bit profound. A lot of people focus on Passion as far as ministry. But maybe one should look more for Fit… where one Fits into God’s work. I like to add a sixth, “Sphere of Influence.” That makes SHAPES. But I will go along with the singular form. I think there is much to be said for the idea of SHAPE in getting some idea of what God has made you to be and do ministerially…. at least initially. As one matures in ministry, I believe our place is less about our SHAPE. Rather the changes mold us to FIT into God’s work. Certain ministries we discover are Fulfilling. We find satisfaction in our place in God’s work. It is not always about Heart or Passion. Rather, one feels that one is where one is meant to be. Does this always happen? I don’t know. But it can happen and does happen. It feels, in many ways that it has happened with us (or at least is in the process of happening). Who we are an ministry becomes more Interactive. 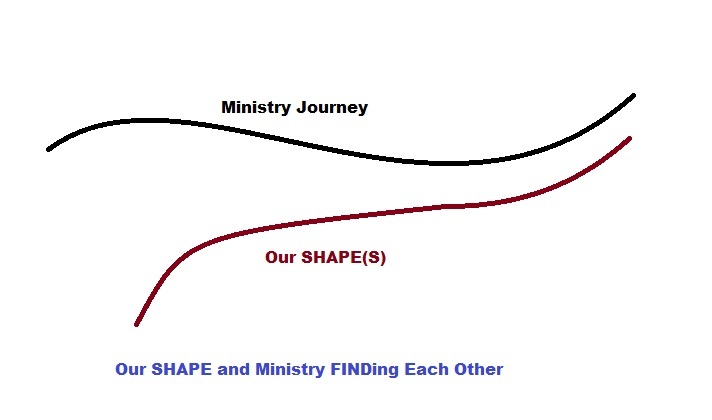 Ministry affects our SHAPE, and SHAPE affects our ministry. We grow into roles and grow out of roles. These changes are also Dialogic. That is, they are part of broader “conversation” between each of us and God, as well as with others inside of and outside of ministry. The result is that Our Ministry is always in flux as is our SHAPE. The goal is to help them FIND each other so that we know where we FIT into God’s Work. Today I heard a sermon of an older man who spent his early years as a Catholic priest and his middle years as a Marxist organizer, before becoming a Baptist pastor. He noted that no step along his path was a waste because he gained from each step and helped him in his life and ministry today. I went formally into ministry when I was 38. Before that I was a mechanical engineer, and before that I was in the US Navy. As a conning officer, my watchstation on my ship, I worked with CIC and the quartermasters to determine where we are and how to get to where we want to go. On the ocean, that can be a bit of a trick… especially in the past. In this day of GPS, it is a lot easier, and even before that, Loran-C and Omega provided help in determining where one was. But before that, things were much more tricky. A fathometer and sounding line can tell the depth of the water below a ship or boat. It is not very good at determining one’s position, although it is okay to support or contradict one’s predicted position. By comparing it with one’s presumed position and the associated sounding line on the chart, one can confirm whether or not the EP (esitmated position) makes sense. Landmarks. Landmarks work great when one is close to shore. One can do line of bearings to multiple landmarks, and triangulate one’s position. Doing this multiple times over time gives a heading. To do this, one must have an approximate idea of one’s location. (not likely to be that helpful if one is totally lost). Otherwise it is unlikely one can match up landmarks to places on a chart. Radio frequency. When one is too far out to sea for visual landmarks, radio beacons can be used for triangulation. Loran-C, and Omega could also be used. Further, radar can be used to pick up certain types of landmarks regardless of visibility. Magnetic. Magnetic compasses point to the magnetic north that can, if you know about where you are, give a pretty good approximation of true north. Celestial navigation. The sun, the moon, and various stars can be used to determine position, as long as one has a good timepiece. Certain stars are classically used because they are brighter, more identifiable, easier to locate, and provide better triangulation. Of these, polaris (north star) is prominent among the stars because moves less than others, staying within about 1 degree of true north. GPS. Satellites provide very reliable triangulation. It is nice because the sensing and calculations are internal. Additionally, it is accurate enough to give location, direction, and speed over water. Inertial Navigation. With an inertial navigation system, as long as you know where you started, the system can tell from changes of inertia where one is now. Gyrocompass. A gyrocompass develops angular inertia to establish a bearing to guide off of. Similar to Inertial Navigation. as long as it is set properly initially, it can continue to give heading guidance after. Life has a chaotic feel to it that the ocean gives. It can be amazingly difficult to know where one is and what direction one needs to go. Without effective navigational skills and tools, one is likely to go in circles. Our social and physical context is very much in flux, and we need something to provide stability. One needs a good unchanging reference. In navigation, the unchanging (or slowly changing) north star, earth’s magnetic field, inertial reference, geosynchronous satellites, and so forth, are needed. We need something stable to base our lives on. For Christians, God in His transcendence, and Christ in His imminence, provide our ground of being… the standard that we can get our bearings from. One needs some idea where one is. Points of reference don’t help much unless you can interpret to the appropriate chart. In Christian thought, we need to gain some sense of who we are and what we need with respect to God and how to know more. One might call this a conversion experience… recognizing our shame and hope in Christ. One needs a good chart/map. Even if one knows where one is based on a reference, that does not necessarily tell us where we are with respect to others and give info on where we are to go. For Christians, the Bible helps us understand where we are to go based on where God/Christ is with respect to us. I had a number of concerns in mind when I wrote One Gospel for All Nations. One of them is a tendency among missionaries (among others): People tend to do contextualization by decontextualizing the Bible. In order to make the gospel understandable, they typically reduce the message to a few key principles or ideas that essentially strip the Christian story from its historical and narrative context.